ECEPTION of Holy Communion is a profound experience and a central feature of the liturgical act. This moment, which defies earthly comparison, has inspired many exquisite chants and hymns, poems and prayers. Over the years, I have shared a number of prayers associated with the Mass that I have found profitable. Back in summer 2015, I posted a series of reflections on the vesting prayers for priests. In 2017, I shared John Henry Cardinal Newman’s prayer before Mass to the BVM and a prayer of farewell to the altar from the Maronite tradition (both here). Most recently, last week I offered to our readers this prayer for priests from the 1940s. Today, I would like to share a brief excerpt from St. Thomas More on the reception of Holy Communion. I find his reflection noteworthy for its practicality and spirit of devotion. OW, WHEN WE HAVE RECEIVED our Lord and have Him inside our body, let us not then leave Him alone as we get involved in other things, forgetting to look to Him anymore. For anyone who would serve a guest in such a way would have little sense! Instead, let all our concern be focused on Him. Let us by devout prayer talk to Him, by devout meditation talk with Him. Let us say with the prophet: “I will hear what our Lord will speak within me” (Ps 85:9). If we set aside all other things and attend to Him, He will not fail to inspire us, to speak to us such things within us that will lead to the great spiritual comfort and profit of our soul. Having received the Blessed Sacrament, we have a special time of prayer. For He who made us, who redeemed us, whom we have offended, who will judge us, who will either damn us or save us, has because of His great goodness become our guest. He is personally present within us—and He has done that for no other purpose but to be sought for pardon so that He can save us. 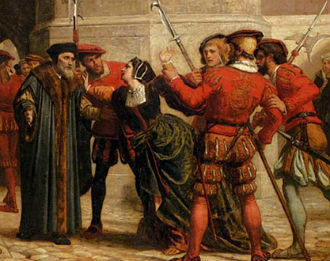 This is courtesy of The Center for Thomas More Studies (URL). ORGANISTS, singers, priests, servers, and others directly involved in the execution of liturgical ceremonies are often called into external action shortly after having received Holy Communion. When perfect stillness and silence is not an option, it can be a struggle to experience the profound communion that our Eucharistic Lord desires to share with us. Let us, therefore, take to heart these words of St. Thomas More!